Mongolia is home to numerous ethnic groups including the Tsaatans or the Reindeer People. Now there are only 400 Tsaatan people in Mongolia and they inhabit the remotest but amazing beautiful mountain taigas. 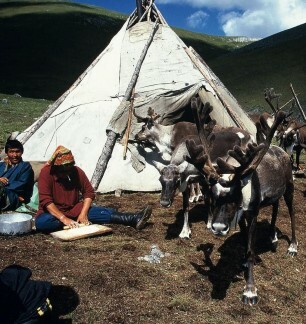 The Tsaatan love their nomadic lifestyle of “breeding reindeer and sleeping in huts”. This tour offers an outstanding introduction to this diverse, ancient and extraordinarily beautiful country, visiting areas and sites that many other tours do not visit and a rare chance to visit the Tsaatans. You will travel to the most picturesque place in Mongolia the “Darkhad Valley” and have the chance to visit families of nomads, remote Buddhist monasteries and traditional events, and to take part in horse-riding or guided walking. Discover the Reindeer People blends landscape and cultural sightseeing in Mongolia and gives you the unique opportunity to understand the secrets behind the Tsaatan’s lifestyle. Please note: The best time to travel to Mongolia is May – October. Special permits are required to visit the region where the Tsataans live and must be obtained 30 days in advance prior to arrival. Arrive in Ulaanbaatar, meet at the airport after custom formalities and transfer to the hotel. The city tour of Ulaanbaatar takes you through some of the principal sights of this unique city. You visit the Gandan Monastery, housing a 26 meter high gilded statue of the Buddha. Your tour also takes you to the Genghis Khan monument on the Sukhbaatar square and the National museum of Mongolia, which has a number of fascinating displays of traditional Mongolian clothing and weaponry, as well as exhibits charting the course of Genghis Khan’s empire-building. Like nearly one half of the Mongolian population, the capital city of Ulaanbaatar herself is a nomad. The city has changed locations more than twenty times over the past 350 years before taking root in her current location in a sweeping valley bounded by four sacred peaks, including Bogd Khan mountain to the south. Indeed there aren’t many world capitals in which you can ride a horse, visit a nomadic family, and enjoy fine dining and luxurious spa treatments all in the same day. Ulaanbaatar today is a vibrant city of more than one million residents. The city reflects a close and sometimes amusing juxtaposition of nomadic traditions and modern society, perhaps best summarized by her skyline dotted with both gers (felt tents) and towering skyscrapers. The city’s contrast can also be found among those who call it home, from traditional-clothing-clad herders, to Armani suit-wearing business men and women, to a growing number of ex-patriots hailing from nearly every corner of the globe. Only in Ulaanbaatar might you find a horse cart bouncing down the central avenue alongside a Mercedes Benz, or a market selling both livestock and designer clothing. In short, there is something for everyone, and always a site to behold in Ulaanbaatar. Morning flight to Moren, which is centre of Huvsgul province. Drive to the north toward Rinchinlhumbe Village with a stop at the Uunshig Deer stones; admire the nature beauty of northern Mongolian spectacular mountains. We break our journey by the river Beltes. Tent camping. The capital of Huvsgul province, Moren has a bustling market for the local nomads – a visit is an interesting cultural experience. As regional centre, Moren is also the point at which flights from Ulaanbaatar connect. Huvsgul province, northernmost in Mongolia, is centered its most distinguishing feature, the pristine Lake Huvsgul, worthy of many words of its own. The province is also remarkable, however, in that it represents one of the most direct and contemporary convergences of the ancient shamanic and relatively modern (12th century) Buddhist cultures of Mongolia. Here in Huvsgul can still be found large populations of people from the old tribes – Buryat, Uriankhai and Darkhad, as well as Tsaatan, the reindeer people. They have lived here since pre-history, their traditional ranges extending northwards into Siberia. The Tsaatan way of life shares much in common with that of the American Indians, who made the crossing to America from these parts across the Bering Strait whilst it was frozen under the last Ice Age. The Tsaatan prefer to live in deer hide tepees rather than ger tents, and their totemic ‘deer stones’, carved with the deer that are said to guide the dead into the underworld, still dot the Huvsgul landscape. Deer stones aside, the landscape are joy – deep green forests of pine and larch intermitted with forest steppe, and many northern animal, bird, and fish species. Today we will drive from Beltes river to Taimen Lodge via the small village of Rinchinlhumbe. The lodge is at the junction of the Jar and Sharga rivers, we will meet Darkhad people on the way. The drive will not be easy – we will be crossing rivers, driving through muds and dirt tracks will be quite bumpy. This stop will take us closer to our most important destination where the Tsaatan people live. Continue the drive to the north along the beautiful river Shishgid and the stunning Horidol Saridag mountains. We stop at Tsaatan Visitor Centre in Tsagaannuur village run by ethnic Tsaatan people. We drive a bit further and leave the vehicles and start horse riding as we enter the Taiga. Break the journey in the southern edge of the Taiga, tent camping for the night. Horse riding through the Taiga in the Huvsgul mountains looking for the Tsaatan tribe summer camp, it might be necessary to ride for 2 full days to reach the Tsaatan camp – depends on the location of the Tsaatan camp. Meals cooked and tent camping. Tsaatan Reindeer People are a branch of the Turkic-speaking Tuvinian or Dukha ethnic group. This small group possesses a social and material culture which has remained unchanged since the Ice Age. Shamanistic or totemic rituals and symbolism are central to the social organization of the Tsaatan. Shamanistic rituals of healing rely on rare medicinal plants and animals unique to this landscape. The Tsaatan are an archaic and ethnographically interesting nomadic groups to be found on the Eurasian continent their lifestyles are both ancestral to all the nomadic herding cultures of Central Asia and are reminiscent of a way of life which was widespread across Europe, Asia and North America 10,000 years ago. Days with the Tsaatan tribe, learn their everyday life and their traditions like riding reindeers, milking reindeers, processing skins etc while enjoying the relaxing, beautiful nature. There’s endless photography opportunity as the Tsaatan people are heart and hospitable – there’s a lot to cover about this vanishing culture and the challenges they face every day. Meals cooked and tent camping near the Tsaatan huts. Say goodbye to the Tsaatan people, start the horse riding through the beautiful taiga to the south. Enjoy the tented camping under the starry sky. We will try to reach the Taimen Lodge by the river Sharga and Jar junction by the evening of Day 11. After breakfast we drive to the south to Rinchinlhumbe village and then continue to Moren on Mongolian famous dirt tracks. We will reach Moren in the evening of Day 13, transfer to a local hotel – hot shower and amenities. Flight back to Ulaanbaatar (flight duration: 90 min), transfer to the hotel. Visit Bogd Khaan’s Palace Museum /the last king of Mongolia/ and see a traditional folklore concert. Farewell dinner at Mongolian Barbeque restaurant. Folklore performances mostly combine traditional songs and dances. Mongolian songs can be divided into two groups: long and short melody sings while there are varieties of traditional dances.